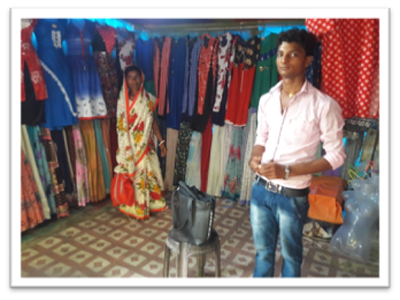 RAHUL KUMAR aged 21 of Chakslame village in Patori says “It was too difficult for my father to manage the family, so he always thought of searching work for me. But timely help of youth group (Ambedkar Yuva Manch) formed by BDVS supported me with Rs-5000/-. With that money I started a readymade clothes shop at the road side and I am earning Rs- 400/- to Rs -500/- daily. This project brought happiness for my family as well as for me. During the difficult situation I joined the youth group. The financial help given through the project was too helpful for me to work independently. Rahul stated ‘I am helping my parents, managing my studies and pushing up my capitals; I am learning to stand at my own feet I don’t need to depend on others’.